LINACs operated in a flattening filter-free (FFF) mode is becoming of increasing interest in recent years. Started in the 1990s, the early research work was focused on the increased dose rate for radiosurgery  or the physics characteristics of unflattened beams. ,, In 2000s, several groups addressed the issue of using FFF beams in IMRT. ,, Rotational IMRT or VMAT has recently become a promising and commercial treatment option. During the past years, feasibility of treating various cancers including prostate, lung, larynx, chest wall, and esophagus using unflattened beams have been reported. ,,,,,,, Also exclusive use of a linear accelerator in FFF mode in 3D CRT planning has also been reported to be feasible. From all these published results, a reduced beam on time (BOT) and comparable plan quality seem to have been confirmed for VMAT plan with unflattened beams. Advantages of removing flattening filter in LINACs thus become more and more convincing. Nevertheless, studies published so far are limited to cases with relatively small planning target volume (PTV) with less peripheral organs at risk (OARs). Nasopharyngeal carcinoma (NPC) is one of the most frequently occurred cancers in certain regions of East Asia and Africa. Although radiotherapy is the choice of NPC treatment, more treatment fractions and longer treatment time per fraction makes it prominent to further improve the treatment efficiency. At the same time, planning of NPC cases proved to be challenging due to the large PTV volumes and the numerous close proximity normal structures. In the present work, using of FFF beams in NPC-VMAT is studied to evaluate whether and to what extent the higher dose rate of FFF beams could be of a solution to the efficiency problem and, to illustrate the performance of FFF-VMAT for NPC cases. Our work was carried out in three steps: (1) A FFF photon beam was modeled in a commercial TPS using the measured beam data from a LINAC operated in FFF mode. (2) Ten NPC cases previously treated in our department were randomly selected. For each case, a VMAT plan using flattened beams (FF-VMAT) and unflattened beams (FFF-VMAT) were designed, respectively. (3) Plan quality and delivery efficiency between FFF-VMAT plans and FF-VMAT plans were compared. An Elekta Synergy LINAC (Elekta, Crawley, UK) was used for beam data collection and treatment delivery undertaken in this study. Beam data of 6 MV photon with and without FF were collected and used to model the LINAC in the Pinnacle 3 (V9.0) (Philips Radiation Oncology, Fitchburg WI) TPS. The SmartArc module of Pinnacle 3 was used to generate the VMAT plans. The usual method of obtaining a FFF beam was to replace the FF with a thin plate composed of various materials. , As an exploratory study, an easier and safer way was adopted in our study: The 6MV photon FF was replaced with the 6MeV electron scatter foil. In such a way, only the configurations of the LINAC control software needed to be changed and the LINAC could be easily restored to its original clinical mode when the research work done. The FFF beam in our study was not suitable for clinical use, but it should be sufficient for exploratory studies. In order to enable the FFF beam delivery in the LINAC, flatness relevant interlocks were bypassed under the guidance of service engineers. Other beam-steering parameters were kept unchanged. Beam data with and without the FF were collected according to the Pinnacle Photon Beam Data Collection (Philips Radiation Oncology, Fitchburg WI) using a Scanditronix RFAPlus phantom (Scanditronix AB, Husbyborg, Sweden) with a compact ionization chamber (Scanditronix/Wellhofr RK Compact Chamber) for depth dose-curve measurements and a diode detector (PFD 3G IBA Dosimetry GmbH, Germany) for profile measurements. Data including percent depth dose curves, output factors (S cp ) and profiles were measured at various depths for a range of field sizes. The FF beam used in our department was calibrated according to the IAEA TRS-277 protocol using Dose1 electrometer and FC65-G 0.6cc farmer ion-chamber (Scanditronix Medical AB). As Xiong et al. concluded that when FF was removed, the original stopping-power ratios as function of %dd(10) x can still be used but with a slightly higher uncertainty. The FFF beam in the present work was thus calibrated using the same methods as FF beam. Modeling a regular LINAC in Pinnacle3 had been described by Starkschall and Bedford. , Similar process had been adapted in our study except that the relative incidence fluence was defined by an arbitrary profile in the TPS to account for the conical shape of the unflattened beam. The cases selected were diagnosed with early stage carcinoma (T1) and were clinically treated with nine fields IMRT by means of a simultaneously integrated boost (SIB) technique. Two planning target volumes were defined: PTV1, the target volume of the primary lesion, which was given to 60.06 Gy in 33 fractions, and PTV2, the target volume of electively treated region, which was given to 50.96 Gy in 28 fractions or 60.06 Gy in 33 fractions depends on the clinical observation (only the latter case was examined in our study). 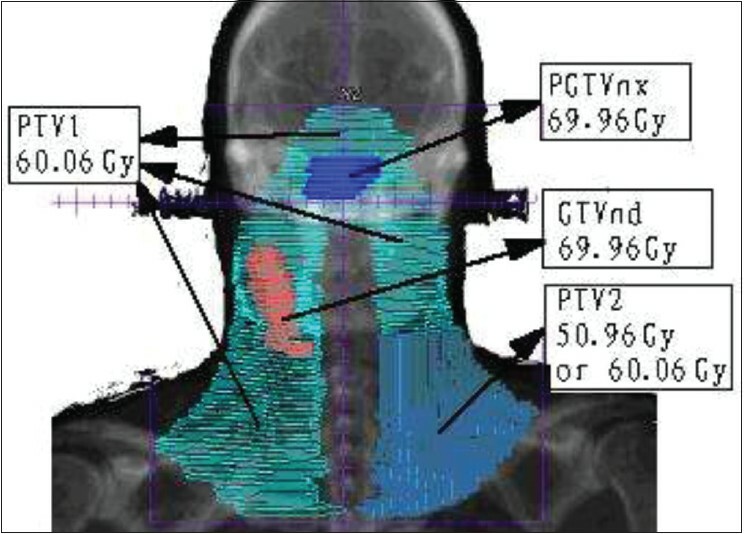 The boost target volume, including the planning primary tumor (PGTVnx, GTV extended 2 mm) and the involved periphery lymph nodes (GTVnd), were treated to 69.96 Gy in 33 fractions. Typical targets layout and corresponding dose levels were exemplified in [Figure 1]. The dose constraints to OARs were listed in [Table 1]. The planning process was started by optimizing a 2-arc (360 deg per arc) FFF-VMAT plan according to the clinical requirements. Depending on the optimization results, fine-tuning of optimization parameters and re-optimizing of the plan might also be applied. The plan was finalized when all clinical requirements were met. Finally, the resulting set of optimization parameters were then applied to a FFF-VMAT plan and FF-VMAT plan using the same process: Beams were reset and plan was optimized for 70 iterations followed by a "warm up" optimization (optimization was started from the plan's current photon fluence) of 30 iterations. As can be seen, this study did not optimize treatment delivery parameters specifically for flattened beams. Treatment plans with flattened beams used the same number of arcs, dose constraints, and planning priorities as used for unflattened beams. When the planning process was done, the collapsed cone convolution superposition algorithm was employed for the final dose calculation. The dose grid was set to 3 × 3 ×3 mm for all cases. Dry runs of all plans were performed on the LINAC to check the real deliverability of the treatment. BOT measured in dry run was used for comparison. Target dose, dose to organs at risk (OARs), and normal tissue (NT), plan delivery efficiency were compared using two-tailed, paired t-tests. The NT was defined as the body volume subtracted by all target volumes. For ease of comparison, plans were renormalized such that 95% of PGTVnx received 100% of the prescription dose. Finally, all plans were delivered on the LINAC and the delivery efficiency was evaluated using the actually measured BOT. Where PTV_p is the percentage of PTV volume receiving a dose no less than the prescription dose, and ISO_p is the portion of the prescribed iso-dose volume account for by the target. The CI values range from 0 to 1, where 1 is the ideal value. In this work, PTV1 and PTV2 were merged together to create a new target (PTV1 + PTV2) for conformity evaluation. In the evaluation of OAR dose, parameters for comparison were selected accordingly: Percent of volume covered by the clinically concerned threshold dose were used for parallel organs and maximum dose were used for serial organs. If no volume of a parallel organ received the threshold dose, mean dose was applied. The maximum dose was defined as the dose to 1cc or 1% of the organ volume, whichever is less. Percent volume covered by 35 Gy iso-dose lines (V 35 ) was used for left and right parotid, and maximum dose was used for spinal cord, brain stem, left and right lens, left and right optic nerves. [Table 2] listed the average values, standard deviations and t-test P values of the selected parameters for both groups of plans. Differences were considered as significant at P < 0.05. The listed averaged BOT was calculated from the plan dry-run process in which all plans were delivered successfully. As for target dose coverage, the maximum difference of averaged dose (for PTV2) was less than 1% and the difference was close to statistically significant. For other targets, dose to 95% of the target was almost the same. Comparison of HI value reveals that difference of dose homogeneity was insignificant. Although the difference of CI was statistically significant, the averaged CI values are very close to each other. Visual check of the DVH curves also confirmed that the dose conformity of targets is close. In general, target dose coverage of FFF-VMAT plan was similar to FF-VMAT plans. 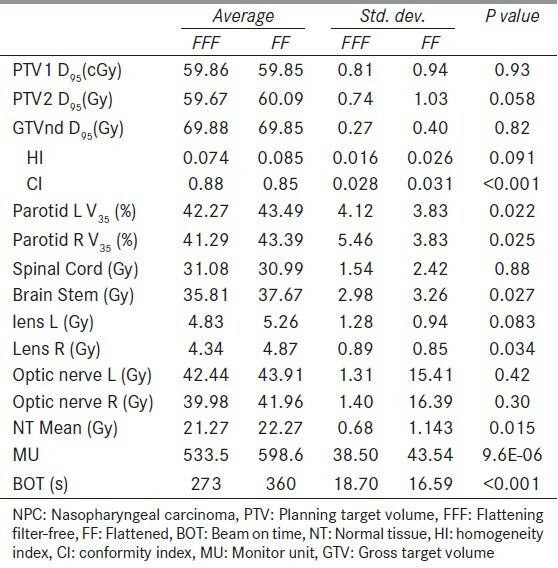 For dose to normal organs, though P values for some of the metrics (parotid glands, brain stem, right lens, and NT) indicated a statistically significant difference, the average values were relatively close to each other. The most notable difference was observed for the right parotid gland, in which the percent volume covered by 35 Gy iso-dose lines of FFF-VMAT plans was decreased by 4.9%. Max dose to other organs was also decreased to some extent. For NT mean dose, a dose fall-off of 4.5% was observed for plans using unflattened beams. Overall, although the difference was slight, plans were consistently better with the filter removed, and surely they were no worse. Concerning the plan delivery efficiency, averagely ~24% of the BOT decrease was observed for FFF-VMAT plans and the difference was statically significant. Clinical use of unflattened beams has been investigated from different perspectives; mainly beam modeling, plan verification, and case planning. The most particular work of modeling an unflattened beam in TPS is obviously the way to account for the conical shape of the beam profile. This has been previously accomplished by replacing the conical reduction which simulating the FF with a negative reduction. In the present work, the energy fluence was modeled by an easier way of providing the TPS with an arbitrary profile. The resulting model, as presented in the previous section, was satisfying. Although no modeling details presented, successful modeling of FFF beam in other TPS had also been exemplified. It seems that handling unflattened beams in today's TPS is no longer a problem. Several groups working on FFF beams have presented IMRT verification using various phantoms and measurement devices in their work. ,,, All the results reported could well meet the clinical criteria. From all these investigations, it could be extrapolated that dose calculation accuracy in state-of-the-art TPS will certainly not be impaired when removing the FF. Considering that the FFF-VMAT plans are not intended for clinical use, dosimetric verification was thus not presented in this work. In a whole, for the NPC cases used in the present work, similar target dose distributions were achievable when unflattened beams were used instead. As the flattening filter (FF) is one of the main scattering elements in the treatment head  , a better OAR sparing is reasonably expected when applying FFF beam in clinical treatment. Peripheral doses in IMRT and SBRT treatment were reported to be significantly decreased in anthropomorphic phantom measurements. , As dose to organs close to the target, though the extent of improvement was much less, a better OAR protection for unflattened beams had also been confirmed by a number of authors. ,,, According to [Table 2], the results in our study generally support these reported data. Whereas, a similar planning study of advanced NPC cases using Eclipse TPS and Varian TrueBeam LINAC performed by Zhuang et al. showed that OAR sparing of unflattened beam VMAT plans was somewhat inferior to that of flattened beam. This may indicate that in a comparison planning study of VMAT technique, patient characteristics, planning processes, TPSs, and LINACs can affect the comparison results. As VMAT and FFF are relatively new techniques in radiotherapy, to further explore their potentials, planning experiences may need to be accumulated and inter-comparison of various TPSs and LINACs may also needed to be carried out. The increase in dose rate is one of the most obvious and attractive effects when removing the FF. Due to the variety in treatment techniques, the increased dose rate does not necessarily directly translate into shorter treatment times. , Experimental data from various authors can serve as good references. Up to now, BOT reduction of more than 70% had been reported in SRT treatment ,,, and ~33% in breast and prostate treatment. , The BOT in our study was ~24% less for FFF-VMAT plans, which was remarkably lower than the above mentioned data. Obviously, in terms of treatment time, treatments with small target size and less MLC movement could benefit more from the increased dose rate of the FFF beam. 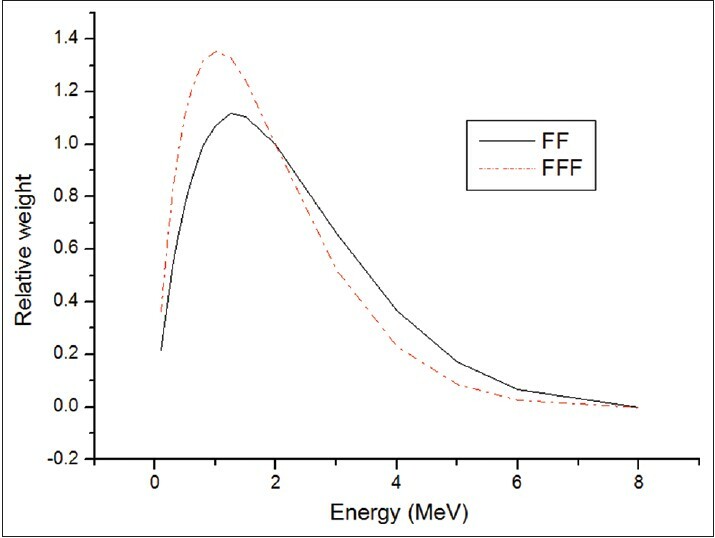 Planning study of various cases using field in field technique illustrated that segments number ratio of FFF beam to FF beam increase with an increased PTV volume. This explains why the relative time decreasing of FFF beam in NPC VMAT cases is less than the reported value. Although the percentage reduction of BOT in complicated NPC case was relatively less, the actual time saved was still beneficial in terms of patient comfort as well as patient outcome. In our study, the optimization parameters were changed over multiple iterations in order to produce the FFF-VMAT plan that meets all the DVH criteria. One issue of such planning process is termed the "weight paradox" by Deasy, whereby the optimal choices for the relative weights of different PTV and OAR optimization criteria are not known and may take many iterations of trial and error to determine. Choosing criteria that are too constraining for the OAR can compromise the target coverage, or vice versa. In the optimizing of a FF-VMAT plan using parameters derived from a FFF-VMAT plan in our study, there's always a possibility that the resulting FF-VMAT plan was suboptimal. Our way to avoid this problem was tried to make the optimization parameters as general as possible in the optimization process. To be specific, the number of optimization parameters and iterations of trial and error were kept as fewer as possible. To achieve this goal, the optimization process was performed by a highly experienced planner. Our results showed that almost all the doses to targets and OARs of the FF-VMAT plans met the clinical requirements. This means that the "weight paradox" problem was alleviated in our study. The beam modeling and planning process demonstrated that commercial TPS used in our study was able to handle unflattened beams. The plan comparison results revealed that in the NPC treatment, the FFF beam when compared to the FF beam, prone to improve the normal sparing while achieving similar target dose distribution. Decreasing of beam-on time in NPC cases was less notable but remains beneficial. 1. O'Brien PF, Gillies BA, Schwartz M, Young C, Davey P. Radiosurgery with unflattened 6-MV photon beams. Med Phys 1991;18:519-21. 2. Zefkili S, Kappas C, Rosenwald JC. On-axis and off-axis primary dose component in high energy photon beams. Med Phys 1994;21:799-808. 3. Zhu TC, Bjarngard BE. The fraction of photons undergoing head scatter in x-ray beams. Phys Med Biol 1995;40:1127-34. 4. Sixel KE, Faddegon BA. 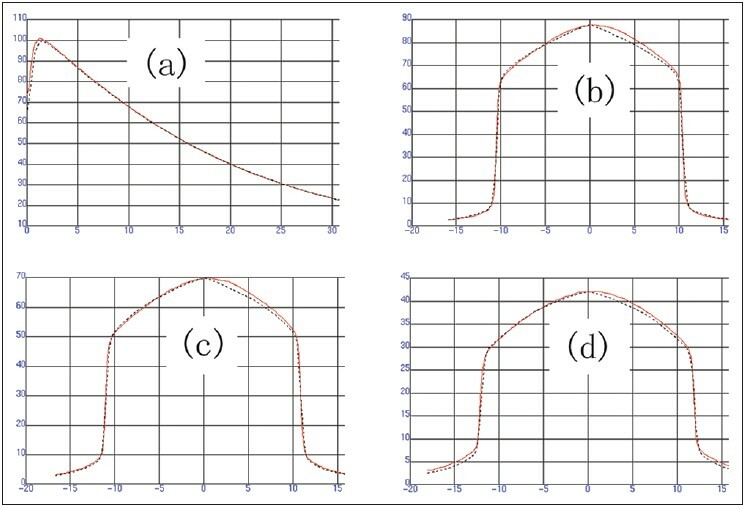 Calculation of x-ray spectra for radio surgical beams. Med Phys 1995;22:1657-61. 5. Fu W, Dai J, Hu Y, Han D, Song Y. Delivery time comparison for intensity-modulated radiation therapy with/without flattening filter: A planning study. Phys Med Biol 2004;49:1535-47. 6. Titt U, Vassiliev ON, Pönisch F, Dong L, Liu H, Mohan R. A flattening filter free photon treatment concept evaluation with Monte Carlo. Med Phys 2006;33:1595-602. 7. Cashmore J. The characterization of unfattened photon beams from a 6MV linear accelerator. Phys Med Biol 2008;53:1933-46. 8. Tsai CL, Wu JK, Chao HL, Tsai YC, Cheng JC. Treatment and dosimetric advantages between VMAT, IMRT, and helical tomotherapy in prostate cancer. Med Dosim 2011;36:264-71. 9. Vassiliev ON, Kry SF, Kuban DA, Salehpour M, Mohan R, Titt U. Treatment-planning study of prostate cancer intensity-modulated radiotherapy with a Varian Clinac operated without a fattening flter. Int J Radiat Oncol Biol Phys 2007;68:1567-71. 10. Zhang GG, Ku L, Dilling TJ, Stevens CW, Zhang RR, Li W, et al. Volumetric modulated arc planning for lung stereotactic body radiotherapy using conventional and unflattened photon beams: A dosimetric comparison with 3D technique. Radiat Oncol 2011;6:152. 11. Stevens SW, Rosser KE, Bedford JL. A 4 MV flattening filter-free beam: Commissioning and application to conformal therapy and volumetric modulated arc therapy. Phys Med Biol 2011;56:3809-24. 12. Mancosu P, Castiglioni S, Reggiori G, Catalano M, Alongi F, Pellegrini C, et al. Stereotactic body radiation therapy for liver tumours using flattening filter free beam: Dosimetric and technical considerations. Radiat Oncol 2012;7:16. 13. Reggiori G, Mancosu P, Castiglioni S, Alongi F, Pellegrini C, Lobefalo F, et al. Can volumetric modulated arc therapy with flattening filter free beams play a role in stereotactic body radiotherapy for liver lesions? A volume-based analysis. Med Phys 2012;39:1112-8. 14. Spruijt KH, Dahele M, Cuijpers JP, Jeulink M, Rietveld D, Slotman BJ, et al. Flattening filter free vs flattened beams for breast irradiation. Int J Radiat Oncol Biol Phys 2013;85:506-13. 15. Zwahlen DR, Lang S, Hrbacek J, Glanzmann C, Kloeck S, Najafi Y, et al. The use of photon beams of a flattening filter-free linear accelerator for hypofractionated volumetric modulated arc therapy in localized prostate cancer. Int J Radiat Oncol Biol Phys 2012;83:1655-60. 16. Nicolini G, Ghosh-Laskar S, Shrivastava SK, Banerjee S, Chaudhary S, Agarwal JP, et al. Volumetric modulation arc radiotherapy with flattening filter-free beams compared with static gantry IMRT and 3D conformal radiotherapy for advanced esophageal cancer: A feasibility study. Int J Radiat Oncol Biol Phys 2012;84:553-60. 17. Kretschmer M, Sabatino M, Blechschmidt A, Heyden S, Grünberg B, Würschmidt F. The impact of flattening-filter-free beam technology on 3D conformal RT. Radiat Oncol 2013;8:133. 18. Tyner E, McClean B, McCavana P, af Wetterstedt S. Experimental investigation of the response of an a-Si EPID to an unflattened photonbeam from an Elekta Precise linear accelerator. Med Phys 2009;36:1318-29. 19. Xiong G, Rogers DW. Relationship between %pdd(10)xand stopping-power ratios for flattening filter free accelerations: A Monte Carlo study. Med Phys 2008;35:2104-9. 20. Starkschall G, Steadham RE Jr, Popple RA, Ahmad S, Rosen II. Beam-commissioning methodology for a three-dimensional convolution/superposition photon dose algorithm. J Appl Clin Med Phys 2000;1:8-27. 21. Bedford JL, Childs PJ, Nordmark Hansen V, Mosleh-Shirazi MA, Verhaegen F, Warrington AP. Commissioning and quality assurance of the Pinnacle(3) radiotherapy treatment planning system for external beam photons. Br J Radiol 2003;76:163-76. 22. Wu Q, Mohan R, Morris M, Lauve A, Schmidt-Ullrich R. Simultaneous integrated boost intensity-modulated radiotherapy for locally advanced head-and-neck squamous cell carcinomas. I: Dosimetric results. Int J Radiat Oncol Biol Phys 2006;64:333-43. 23. Feuvret L, Noël G, Mazeron JJ, Bey P. Conformity index: A review. Int J Radiat Oncol Biol Phys 2006;64:333-42. 24. Zhuang M, Zhang T, Chen Z, Lin Z, Li D, Peng X, et al. Advanced nasopharyngeal carcinoma radiotherapy with volumetric modulated arcs and the potential role of flattening filter-free beams. Radiat Oncol 2013;8:120. 25. Chaney EL, Cullip TJ, Gabriel TA. A Monte Carlo study of accelerator head scatter. Med Phys 1994;21:1383-90. 26. Cashmore J, Ramtohul M, Ford D. Lowering whole-body radiation doses in pediatric intensity-modulated radiotherapy through the use of unflattened photon beams. Int J Radiat Oncol Biol Phys 2011;80:1220-7. 27. Kragl G, Baier F, Lutz S, Albrich D, Dalaryd M, Kroupa B, et al. Flattening filter free beams in SBRT and IMRT: Dosimetric assessment of peripheral doses. Z Med Phys 2010;21:91-101. 28. Navarria P, Ascolese AM, Mancosu P, Alongi F, Clerici E, Tozzi A, et al. Volumetric modulated arc therapy with flattening filter free (FFF) beams for stereotactic body radiation therapy (SBRT) in patients with medically inoperable early stage non small cell lung cancer (NSCLC). Radiother Oncol 2013;107:414-8. 29. Prendergast BM, Fiveash JB, Popple RA, Clark GM, Thomas EM, Minnich DJ, et al. Flattening filter-free linac improves treatment delivery efficiency in stereotactic body radiation therapy. J Appl Clin Med Phys 2013;14:4126. 30. Deasy JO, Alaly JR, Zakaryan K. Obstacles and advances in intensity-modulated radiation therapy treatment planning. Front Radiat Ther Oncol 2007;40:42-58.